Now that it costs the government more than one cent to mint a U.S. Penny, pressure is building to eliminate pennies altogether and round prices to the nearest nickel. An economist who's studied the idea says it would have no impact on consumers. Robert M. Whaples, professor of economics at Wake Forest University and.an expert on the history of the U.S. economy, recently presented his findings at the John Locke Foundation, a nonprofit, nonpartisan think tank. "It's time to eliminate the penny," said Whaples, who estimates that the United States loses roughly $900 million a year on penny production and handling. In a penny-free marketplace, what consumers pay at the cash register would be rounded to the nearest nickel for cash transactions. Because retailers price items to end in nine to entice customers, penny-preserving proponents claim that prices would tend to round up rather than down, creating an extra expense or "rounding tax" for consumers. Some contend that this would be especially burdensome for the poor, who are thought to use cash more often. Based on current retail prices, Whaples found that getting rid of the penny would not lead to a rounding tax. His research focused on data from a week's worth of transactions (about 200,000) from 20 locations of a gas station and convenience store chain in Alabama, Georgia, North Carolina, Pennsylvania, South Carolina, Tennessee and Virginia. He concentrated on the cash purchases and rounded prices to the nearest nickel, applicable taxes included. "Customers wouldn't lose from rounding our current prices, these data say," said Whaples. "In fact, I found that customers gain just a miniscule amount, about 1 cent for every 40 transactions, which really amounts to zero. The convenience stores and the customers basically broke even." Whaples also compared a store in a wealthy neighborhood and one in a poorer neighborhood of the same city and found that rounding prices has the same effect regardless of the consumer base's socioeconomic status. "The only group that I found systematically losing is people who pay cash for purchases that are less than $1 with a price that ends in nine, but there just aren't very many of those purchases out there," Whaples said. Whaples said debunking the myth of the rounding tax adds to the mounting evidence in support of eliminating the penny. "The cost of making our money, the penny, is now more than 1 cent per penny," said Whaples. The increased cost is mainly attributed to the rising cost of zinc, the metal that makes up 97.5 percent of the penny, as well as to the costs of minting and transportation. Whaples said that official estimates of the cost to the government ignore the substantial cost to the Federal Reserve System of transporting and distributing pennies. "There's a whole range of other costs that we as consumers are bearing in dealing with pennies," Whaples said. Other costs can be broken down into two areas, the first of which is the loss of time spent handling pennies during physical cash transactions. People lose a second or two every time they dig up pennies to pay a clerk or wait for a clerk to give them pennies as part of a transaction. Whaples said that based on the average American wage, $17 an hour, every two seconds of an average American's day is worth 1 cent. "That's going to add up to about $300 million per year for the U.S. economy," Whaples said. 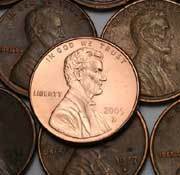 Penny usage also costs consumers because it prevents the use of a more practical coin, the $1 coin. "There's this cash drawer sitting there with four slots for coins," Whaples said, describing a typical cash register. "Currently, there's (a slot for) a penny, a nickel, a dime and a quarter. If you freed up that penny space, there would be an open place and, naturally, we would move to using a $1 coin. The Federal Reserve has estimated that replacing paper $1 bills with more durable $1 coins could save $500 million a year." The penny, first minted in 1787, was the first currency of any type authorized by the United States. The design for the first penny was suggested by Benjamin Franklin. Paul Revere supplied copper for the minting of pennies during the 1790s, and Abraham Lincoln's image has graced the coin since 1909. Whaples said the coin's long history and America's sentimental attachment to it make many people reluctant to get rid of the penny. "What I've outlined in my research is the cost that we impose on ourselves by having pennies, by having this emotional attachment to the penny," Whaples said.